Well we got here! Long day, some auto problems, but we got here!!! I’d made dinner reservations at the Scargo Café across from the Theater and we met there just after six. Rita, Susan, another fan, Chris W. and her friend Pat were waiting for us there. Also at dinner, besides Jane and myself were Alan Prigge, David’s publicist, and his nephew Sean and his girlfriend, Alaina. We met, and sat down to dinner filled with gabbing and gossip and lots of laughs! Wonderful to meet a lot of List-Sibs under such wonderful circumstances! Check out the wonderful menu of Scargo Café online to see what we all feasted on! It was wonderful! Finally stuffed, we made our way across the street to the theater, planning on meeting again after the performance, as we all were sitting in different parts of the theater. David wasn’t onstage as the curtain rose, but shortly into the scene, he entered. His first costume was a blue, black and white running suit, with a fanny pack. From then on, the show moved what seemed to be impossibly fast, and too soon it was intermission…then the show was over. David looked terrific! Suits, shirts and casual clothes all made him look simply great! The part, as it is written, is for a man of about ’60, and there was no doubt in my mind that he played the part very well. As to the play itself, well it is an odd, very ethnic comedy, and much of the humor seemed lost on the audience. It is written by and for New Yorkers, with many New York jokes, which some of the audience didn’t seem to get. It had some very good moments, and the entire cast was very good. As far as David’s performance is concerned, I thought he was quite good. He was able to show in this, a range of emotions that I haven’t seen him do in one set piece in all of the Television, Movies and theater I have seen him do. The show moved fairly quickly and we soon found that it was over. We went outside to meet the rest of the group to go backstage. You all have to realize, backstage at the Playhouse is outside, in the area behind the dressing rooms. So we met up with the group, and walked around back. Alan, David’s publicist told us that Marta Kristen * Lost in Space was at the show, and sure enough, there she was backstage, with several other women. She told Alan that one of her family members had a house on the Cape, and when she saw that David was doing a play there, she had to come and see it and him. We were waiting backstage and David came to the back door and down the stairs. He went right to Alan, and they talked for a moment or two. He looked up and saw Marta, called out her name, going over to her, and shaking hands and chatting a bit with her. Marta Kristen and David Hedison chatting while her family looks on. They said goodbye, and he turned, asking "Where’s Linda?" I gave it a "Here I am…" and he came over to the group, giving me a kiss and hug, and asking right away, "What did you think of the play?" I told him that it was interesting and very ‘New York’. He agreed, telling me that the audiences at the Playhouse either loved it or hated it. We both agreed that it is a different piece and then we turned, and I introduced him to all the ladies there. He greeted Jane with a kiss and ‘Hello, Jane’, and he took the time to greet everyone I introduced him to, ask where they were from , and thank them for coming to see him in the show. He had met one of the other fans before, so he chatted with her for a while. Rita and another fan each gave him small gifts, and he was gracious and appreciative. He signed programs and posed for pictures. As Alan was trying to take the pics, he was giving him a hard time. David told Alan to count to three and then take the shot. Three times, Alan didn’t count, and David teased him terribly about it, finally telling Alan that he, David, would do the counting… He did and we all laughed. We said our goodbyes and Jane, Alan and I told him we would see him the next night, Saturday, again. He smiled and said thank you to everyone and got into his waiting car, to go and meet the playwright. We all left, promising to see each other the next day, before Jane and I go to see the show again. Morning – Chris W. and her friend Pat met us at our motel, The Briarcliffe Motel, with Dunkin’ Donuts and coffee. Alan, Jane and I met them at the pool,and we spent a wonderful three hours talking, talking and talking getting to know one another even better in person. Alan regaled the ladies with tales of his days as a PR man with 20 th, and Universal, and we shared pictures of David and the stars of the show, tales of writing, and I shared my old, very old scrapbooks. Too soon the time was up and we had to say goodby, as Pat and Chris had to get to Providence to catch a plane. Pat is not a Voyage fan, just a good friend of Chris’. She’s a mom and mother of two, both grown, and this was her first experience with a fandom and meeting someone like David. She assured us when she left, that she’ll be with Chris when she does something like this again! Jane and I spent the afternoon shopping…Dennis has some wonderful shops that I discovered when I was there in ’98 and I wanted to share them with my cohort! We had a great time, found a bunch of goodies, returning to the motel to shower and change for dinner and that evenings closing performance of The Allergist’s Wife. We had dinner at Storey’s, a restaurant at the head of the drive to the Playhouse. We then met the girls at the nearby ice cream parlor for dessert, before the show. 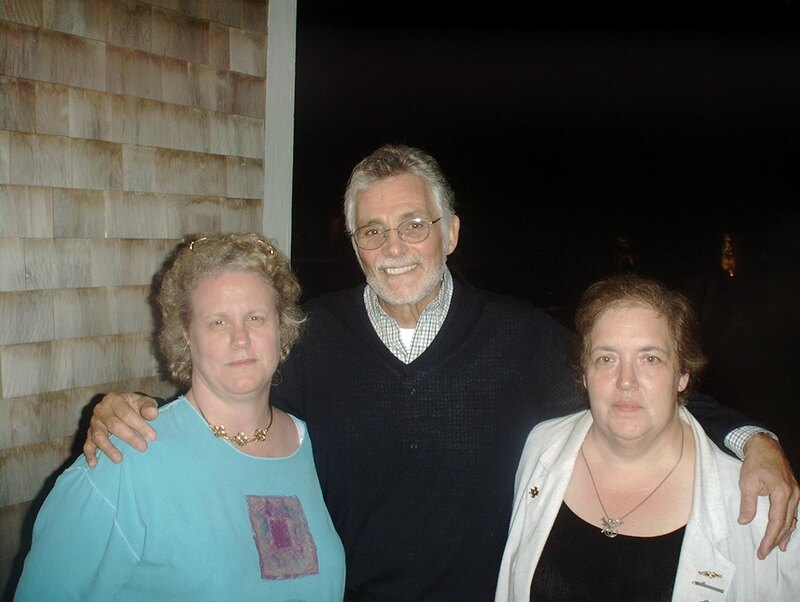 Once again, we had fun talking with friends, about the show, their trips to the Cape, families, and the like. The time here also passed too quickly, and we had to say good by to friends, knowing that we would be talking to them here on the net, and glad to have met them ‘in person’. This was the final performance of The Allergist’s Wife. Again, David was very good and we enjoyed the performance once again. We grabbed a bunch of programs for friends and headed backstage to see David again. He had several other fans there, and we waited until he was finished with them and he came over to us. He was his usual kind self, greeting us with a hug and kiss, signing some programs for us to bring home for friends and chatting about the play and other things. Tonight I thought he looked tired, and no wonder... 16 performances in 12 days is a lot. Most of the Equity actors I work with are younger, and they are tired after at two or three week summer run. We chatted a bit more and then after a few pictures, took our leave. There was a small celebration, to end the run, that David had to attend, and he was flying back to LA early the next morning from Boston. We wished him a safe trip home, he hugged and kissed us goodbye, and we left. Once again, I am so glad that we came to the Cape. David is so gracious, kind, and charming to everyone. He makes a point of listening to people, learning their names, asking where they come from and making each and every person feel special. Jane and I are fortunate to call him a friend. Sunday - On to the Nautilus! We got up early, checked out and headed toward Groton. 9:00 AM on the road, off the Cape and BINGO! TRAFFIC! What took an ordinary two hours coming up, took three going south. Well, no problem…We discussed three new story ideas, laid them out, have a good handle on them…SIGH! As if we need more stories to plan! We stopped for lunch at the Cracker Barrelin Rhode Island and then finally, Groton and the Nautilus. 1:00 PM – we made the turn to the Submarine Library and Museum. 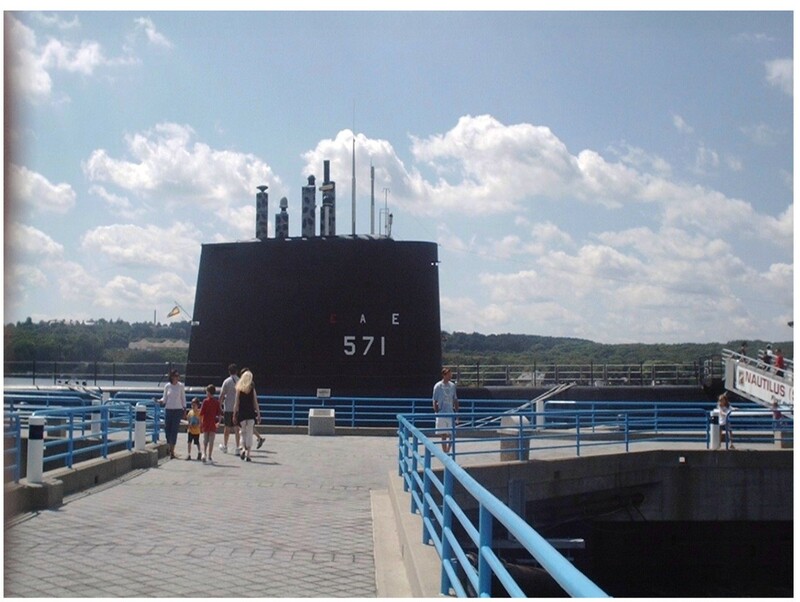 The Groton Sub Base is on the other side of the road from the museum grounds. In deference to 9-11, the security on the base was very heavy and very obvious going onto the base proper. As you enter the museum grounds, on the right is the sail from the first SSBN, the George Washington *more about this later. We pulled into the parking lot and there, at her moorings, is the Nautilus. The only different note about her compared to other subs, is that on her deck, to give access to the boat, is a plexiglass entry to the modified gangway that gives access to the boat. To enter the museum, you walk through the ribs of two subs, one early one and one of the later class of boats, so that you can see the difference in the evolution of them. Once inside the foyer, a security check. It was being given by a VERY YOUNG warrant officer. He was courteous and pleasant, but very thorough. Of course, yours truly had to set off the alarm … they said it was my eyeglass case! Oh well, at least, finally we were inside the building...and soon on our way to the boat. In the foyer is a hanging replica of Jules Verne’s, Nautilus. We just stopped, and took it all in. The museum is filled with display after display of the history of subs, of control rooms, navigation, and sonar rooms taken from now scrapped subs of the WWII era. There are films, and models, and so much that I could spend pages and pages writing about it. They have a research library on submarines and Jane and I will be going back there. We spent roughly an hour in the museum itself, we could have spent much, much more. Briefly, we say displays of the Turtle, the very first sub, a rescue vehicle, and one of the class of sub used in The Enemy Below. Finally, we just decided it was time to visit ‘her’. We headed to the boat. She is beautiful! We headed up the gangway, and into the plexiglass enclosure. Two sailors, who hand you a wand that has an earphone, and tells you the story of the boat, as you move through her, manned it. To get below, you descend a doubled gangway, and enter the boat in the forward torpedo room. All the displays are behind plexiglass, and if you take the virtual tour online, you will see and hear what we did, the difference being the sense of size and room being on her as opposed to seeing pictures. To be truthful, it was quite a rush to ‘walk the boat’. Something I never thought I’d ever do!! One thing that was immediately obvious was the size, the sense of confined space. So very different from the ‘spacious’ Seaview. And a note to all of the fans of ladies in high heels on the boat, as visitors or whatever...in the days of the Nautilus, when a woman wore heels, believe me, no way on God’s good earth, or under God’s good ocean, could a woman in high heel shoes go through the water tight hatch with ease. The coaming is about calf high, and it’s about three feet high, and two feet wide. Once through the hatch, we were in Officer’s Country and their wardroom, galley and quarters. The wardroom, as with much of the boat, has pseudo paneling on the walls. Some what roomy, but still small. The only man on the boat with his own quarters and head is the Captain. All the other officers double bunk or four share a cabin. Heads are shared. Size wise, this Captain’s Cabin is about the size of Lee’s head on the boat. Talk about small!! We went down a deck to the Control Room - nothing like on the Seaview. The periscopes, yes two, are central to the Plot Table. Navigation is separate, as is the Radio Shack. We moved to the Crew’s Mess, which was fairly large, with the Chief’s quarters off this companionway. The Chiefs have their own quarters and wardroom, and no matter who you are, officer or EM, you knock to enter. There is no Sick Bay on the boat. It’s a space the size of a small closet, and Sick Call is held by a corpsman in the Mess. The Crew bunks four high. The first bunk is on the deck. And there is very little headroom between bunks. All the sailor’s belongings are stored under their mattress, in sectioned areas, with some pictures on the bulkheads… It was a very Spartan lifestyle. After leaving her, reluctantly and taking the last few pix, we went shopping. The museum store has everything you can imagine regarding Submarines. There are books, emblems, stickers…well everything that you can imagine, as well as a research Library. If you care to get it right, when you write about subs, here is the place to come. They also have an online site. Access is through the sub museum site. And if all else fails, you can call them. After we bought all that we could for the moment,( keyrings, books, posters, patches, decals, etc.) we left the store, and the museum. We had one last stop, the sail of the George Washington. We scoured the sail, and found no hatchway or evidence of anyone. On the Seaview, there is one above the dive planes, and one on the deck level. On this sail, there was none. Unfortunately, there was also no access to the flying bridge, so we simply had to be satisfied walking around it. One thing to note, we both could walk under the dive planes with out bending. I’m 5’6" and there was headway still, so just thought I’d add that bit of info. After that we left Groton, on the road home to New Jersey. In spite of the car issues, we had a great weekend, David was wonderful, and the Nautilus, well, anyone who writes about that fabled boat should take the time to visit her. It's something you will never forget!